Whether it’s playtime or snack time, your baby is a part of the family. That means it’s essential that you involve them in your family’s activities and daily routine. There’s no better way to do this than using a baby floor seat. These can provide your child with the support and comfort they need. What’s more, you can use them in a variety of places. Whether you’re at the table or on the floor, your child can always be next to you. I love my child’s baby floor seat. It keeps my baby in place and engaged with whatever it is they’re up to while allowing me the time to get on with my tasks. To help you out, I’ve taken the time to find some of the best models, so you don’t have to. 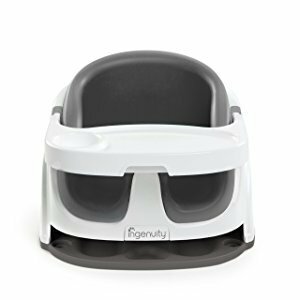 If you are you in need of a smart, straightforward and sophisticated baby seat, there may not be any need to look further than Ingenuity’s 2-in-1 Baby Base. With this outstanding floor seat, you can enjoy the benefits of a removable tray. This is ideal for keeping food and drinks in place during meal times. You can also store the tray in the bottom of the seat while it’s not in use. The tray also includes a cup holder to minimize the risk of those inevitable spills. It’s completely safe for cleaning in your dishwasher, saving you so much time. This is the time you could be spending making memories with your little bundle of joy not cleaning messes. Unfortunately, this seat doesn’t come with any toys, which means your child may get bored, but as you will have plenty of toys around the house, this should be easy to solve. What's Great About It: As with any children’s product, safety is a key concern. Ingenuity has incorporated an impressive three-point harness system. This ensures that your baby is safe, secure and comfortable at all times. This seat is an all-rounded winner when it comes to floor seats. 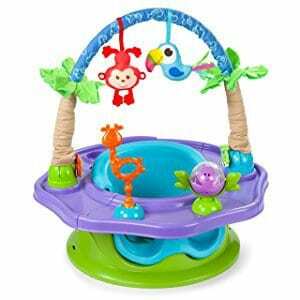 Designed to be similar to complete play sets, there’s plenty for your baby to enjoy. The leading feature of this unique floor seat is its unique ability to grow with your baby. This is achievable by using the three simple stages. Firstly, this seat will act as a support seat to keep your baby upright. As your child grows, it can transform into an activity seat. This is perfect for engaging your child’s curious mind. Finally, you can use the seat as a fully-functional booster seat. This is ideal for making the transition from a baby seat to an adult chair. The seat is home to six engaging toys to keep your child entertained. This reduces the risk of a crying and unhappy baby. There’s also a secure three-point harness system to make sure your baby doesn’t go crawling off around the house. You’ll have to wait for your child to become four months old (rather than the usual 3 months old) to use this seat. It is a small concession when you consider than you will not need another baby chair. You have to assemble the chair using a screwdriver first, which is a small price to pay. This is a quality seat that you and your baby will enjoy for many years to come. What's Great About It: To make things easy for you, Summer Infant has incorporated a rotating tray feature. This means your baby will be able to reach every single toy with ease. No straining or hassle required. 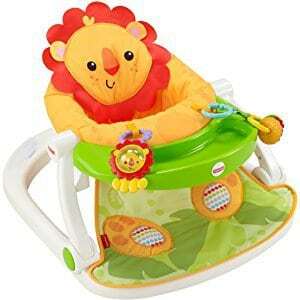 This funky little chair is perfect for children and babies with vivid imaginations that want to play their days away. With them in mind, this jungle-themed seat is both vibrant and attractive. This makes sure that play time and lunchtime are never boring again. Furthermore, your baby will be able to enjoy the soft fabric materials, ensuring that your baby is not only safe, but comfortable at all times. Moms, you’ll be secure in the knowledge that your baby’s delicate skin has minimal risk of being irritated by the materials that have been used. Feature-wise, the Fisher Price Floor Seat has a large, widespread base. This gives your baby greater support while using this chair. There are foot pads to keep your baby’s feet rested. These make fun little squeaking sounds whenever they’re pressed which always results in little giggles. Furthermore, this captivating seat comes with built-in toys and a removable tray. This keeps your child entertained while you can quickly clean up after every meal time. What's Great About It: When the chair isn’t in use, you won’t want it lying about causing a potential tripping hazard. Instead, you can fold this seat flat, allowing for easy and space-efficient storage. One of the most traditional floor seats on the market, Bumbo has been around since the industry began, which makes it a product that’s backed by decade’s worth of experience. 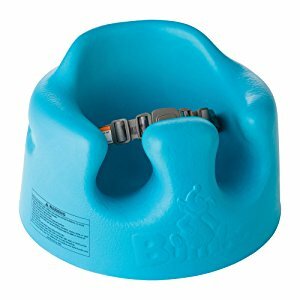 Bumbo has taken the no-frills approach with their latest floor seat. They give you a simple design that has everything you could want or need. Bumbo produces this seat using comfortable and supportive, non-toxic polyurethane foam. This foam gives the seat its lightweight design and ensures it’s incredibly easy to clean. This means you can save time tidying up those unavoidable spills and messes. There are also eight colors to choose from, allowing you to buy the perfect one to suit your home’s décor or your baby’s personality. There are no entertainment features to keep your child occupied, but you can easily place some of your child's favorite toys in front of them. Take note that you also can’t adjust the leg spaces. This means some parents may have trouble getting their child in and out of the seat if their baby is a bit chunkier. What's Great About It: One of the best features of this model is the 3-point harness system. This feature is ideal for holding your little monster in place, minimizing the risk of a potential escapee crawling around your home. More in Baby Products: What are the Best Baby Humidifiers? Choosing any product for your baby is no easy task, and the same goes for deciding which baby floor seat is best for your household. Here are a few points to consider when it comes to making that important purchasing decision. Every family is unique and has their own set of requirements when it comes to their baby seat. This means you need to identify the main purpose for your baby floor seat. To give you an idea of what I mean, consider the reason that you started looking for baby floor seats in the first place. Maybe you wanted a supportive seat during meal times? Maybe you want a seat that can provide your baby with entertainment? Perhaps you need some time to carry out daily tasks? You could be looking for a seat that you can use to play with your baby in a comfortable position. Whatever the reason, bear it in mind when it comes to choosing the seat that’s right for you. There are chairs with specific purposes and others that you can use universally. However, to make the best decision, ensure this is the first consideration you make. For a newborn child, a floor seat is inappropriate. This is because most seats don’t come with adequate head and neck support. The majority of floor seats will be available for babies aged from three months and above. You’ll also want to consider the weight of your baby. Typically, a seat will cater for children up to 25 pounds. However, you’ll want to check the manufacturer’s recommendations. You may also be able to adjust the seat as your baby grows. These are perfect as a one-size-fits-all product. This means you’ll only ever have to buy one seat for your baby’s entire childhood. Considering the size, there are two things you’ll want think about. Firstly, you’ll want to check the size of the seat itself. If you’re living in a small household, or you plan on using the seat in a confined space, you’ll want to look for a smaller seat. This allows you to maximize space without compromising when it comes to functionality. Typically, these seats will be lighter and more compact. However, they won’t normally contain any entertainment items and toys. Likewise, you’ll want to take note of the size of your child’s thighs. With smaller seats, you may not be able to adjust the size of the leg holes in the seat. With larger babies, this may cause a struggle getting your child in and out of the chair. As you’ll know, this usually causes a lot of hassle and a crying baby. When looking for the ideal baby seat, there are a couple of things you’ll want to remember to look for. I always look for a seat that’s high. This is so that the seat will provide your child with a suitable level of arm support. Likewise, it’s always good to look for a floor seat with an ergonomic design. This ensures that your baby is comfortable while using the chair because the materials will mold to your baby’s body shape. It’s also essential to bear in mind that your baby’s spine is a ‘C’ shape, not an ‘S’ shape. If your child is laying down a lot during the day, this can place a lot of pressure on their spines. It’s believed this can cause growth problems or back pain in later life. Always check to see what materials your preferred floor seat uses. One aspect you’ll want to consider is durability. If you are using your seat during meal times, you will want a seat that is quick and easy to clean. There are a couple of materials that may be used in a baby floor seat. Firstly, you may find seats that are made of polyurethane materials. These are great as the seats will be soft, comfortable and relatively easy to wipe clean. Seats made from this material are usually very lightweight thanks to its low density. Secondly, you may find a seat that’s made using plastic materials. These seats commonly have removable external liners. This makes them ideal to use as your child grows. The exterior material layer is also removable for easy cleaning. Finally, you may come across a seat that’s made solely from plastic. These seats have an outer washable fabric, such as polyurethane, cotton or polyester. These fabric layers will be completely removable and suitable for machine washing. This makes cleaning up after dinner time a breeze. Additionally, these materials will be soft, so there’s minimal risk of them irritating your child’s delicate skin. Always avoid plastics or fabric materials containing BPA or other toxic chemicals. These chemicals are absorbed through your child’s skin when contact is prolonged. These chemicals cause developmental and reproductive issues in later life. Whichever floor seat you decide on, make sure that it’s the right one for you and your child. Consider the aspects above and always put your child’s safety and well-being first. You can then go about your day, safe in the knowledge that your little bundle of joy is comfortable and happy. This allows you to concentrate on the more intimate moments of being a parent.